Top row: Kathryn Patrice Doepel, Randi Marie Ruggles, Acacia Lee MacDonald. Bottom row: Ralph James Aschenbrenner, John Leonard Fort, Paul Raymond Defalco. At about 7 a.m., Morro Bay police, along with the San Luis Obispo County Narcotics Task Force and a sheriff’s K-9 unit, served a narcotic search warrant at a home located in the 900 block of Allesandro Avenue. Officers found heroin and methamphetamine, as well as drug paraphernalia, at the home, according to the Morro Bay Police Department. For several months, Morro Bay officers had been investigating reported drug activity at the home, which was alleged to be a drug house. Inside the home, officers discovered several people who were under the influence and in possession of illegal narcotics. Officers arrested three men and three women on a variety of charges, including possession of methamphetamine, possession of a controlled substance, possession of drug paraphernalia and being under the influence of a controlled substance. Randi Marie Ruggles, 40, was charged with maintaining a drug house. Ruggles remains in custody with her bail set at $20,000. 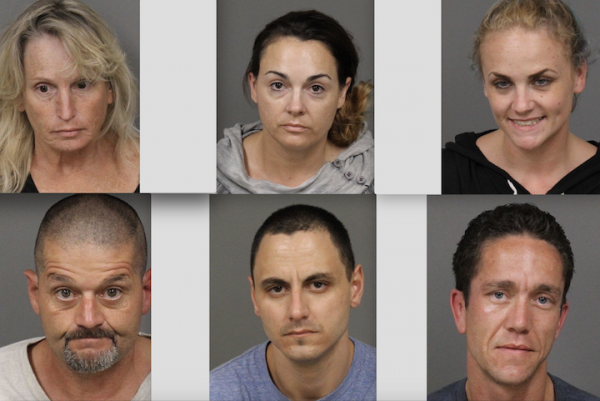 Officers also booked Ralph James Aschenbrenner, 47; John Leonard Fort, 33; Acacia Lee Macdonald, 30; Kathryn Patrice Doepel, 54; and Paul Raymond Defalco, 33, into the San Luis Obispo County Jail, but they are not currently in custody, according to the sheriff’s office website. Morro Bay police are continuing to investigate the case. Anyone with additional information is asked to call the police department at (805) 772-6225 ext. 427.